Two Week 3 games over the past weekend were played on Saturday, August 26, and two on Sunday, August 27. 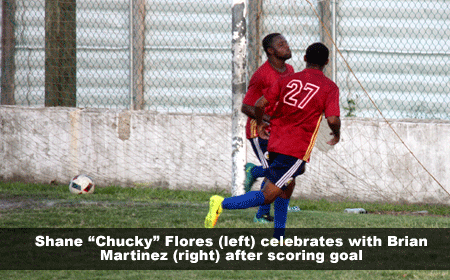 On Saturday afternoon at the MCC Grounds, after a scoreless first half, BDF veteran Vallan Symns missed a penalty at the 76th minute (off the goal post); but the Bandits’ luck ran out ten minutes later, when BDF’s Shane “Chucky” Flores, trailing on the left wing, got an easy tap in, after right wing Brian Martinez’s shot to the far corner was deflected by Bandits goalie Devin Nunez at the 86th minute. BDF, 1-nil, over the Bandits! (Bandits may be in a slump lately. 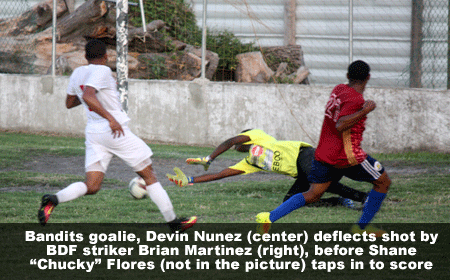 Goalkeeper Shane Orio, who normally does a lot of the talking to his team at half-time, was notably absent on Saturday; and head coach Kent Gabourel was ejected from the game at the 84th minute by referee Juan Baeza from Corozal.) Later on Saturday night at the M.A. Stadium in Independence, it was 1-1 between home standing Placencia Assassins FC and San Pedro Pirates FC. Rollin Burgess (22’) gave the Assassins the first half lead, but Andrew Allen (57’) equalized early in second half for the Pirates. On Sunday afternoon at the Victor Sanchez Union Field in Punta Gorda, visiting Wagiya FC exploded for 3 goals, after going scoreless in their first two outings this season, to take the 3-1 victory over home standing Freedom Fighters FC. Shaking the net for Wagiya were Krisean Lopez (38’) and Aaron Lopez (48’ & 60’); while the lone strike for Freedom Fighters was a penalty conversion by Leary Simon (65’ PK). And later in the night at the Isidoro Beaton Stadium in Belmopan, an early goal by Carlton “Fubu” Thomas (7’) was enough to give the home team, Police United FC the 1-nil win over Verdes FC.